Which 111th plan is moving forward? Not as smart as Cuomo. In the Metroplex, they actually announced they were proposing to siphon money from mass transit to pay for underfunded pensions in other categories. The MTA Board equivalent symbolically voted it down. All such shifts, of course, are in addition to mass transit service cuts due to mass transit pension increases/underfunding. And remember, at the end of the Voice article Samuelson implied he hasn’t given up on 20/50. If Fred Baptise can completely rule out a bike lane ever going on Franklin Avenue, that’s an act of bad faith that shows he shouldn’t serve on his community board, at least not as the chair of the transportation committee. And it’s more proof that the process for fixing dangerous streets is completely broken. DOT has a moral obligation to stop begging these boards for approval before they’ll act. It’s 2017. Bike lanes are nothing new. They work. It’s time to fix this already. “It’s been a long process, at times contentious, but … last year DOT and the elected officials and the advocates in the community came together on a compromise proposal on 111th that we all signed off on,”[Trottenberg] said. Apparently the bike-ped expansion on the Brooklyn Bridge is not in the budget. Short of taking away traffic lanes, the bike-ped expansion was probably a non-starter for engineering reasons. The Brooklyn Bridge’s load constraint is severe. It’s unlikely the Bridge could have simultaneously supported: the extra dead weight of the deck expansion; the extra live load of additional pedestrians and cyclists; and the existing live load of automobile traffic. So much for it being eight times as strong as it needed to be, and carrying a railroad, which is what was said in the 1880s. Taking away lanes from motor vehicles may be necessary in the end as it is. Trucks and buses are already banned. I know that drivers are not paying the actual cost of using/maintaining the bridges (which absolutely needs to be addressed) but drivers do pay taxes. The headline makes it seem like drivers are somehow separate from taxpayers. Not necessarily. Commuters from outside the city do not pay city taxes unless they are city employees, and some percentage of people who drive are essentially in a black market economy, avoiding tax. Most obviously and most damagingly, intercity trucks drive through but do not pay for these bridges. Since we don’t know the actual numbers for any of those categories, I think it would have been fair to say “some” drivers. This can easily be done without harming the sacred private car leeches because BB motor traffic peaked over a decade ago. 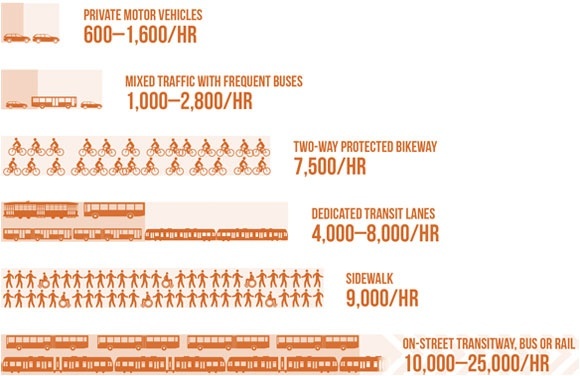 A 10′ bike lane would carry 7,500 cyclists peak hour versus around 1,600 cars. As everyone knows, the inclusion of private cars on the East River Bridges reduced through put to 1/3 versus without private cars. Most New York City public employees who live outside the city do no pay city taxes. I know for a fact that teachers do not, but cops and firefighters do, something imposed on them by contract back in the 1970s. I can see that going away. “If you live in New York City and earn income, you are charged personal income tax. The tax is administered and collected by the New York State Department of Taxation and Finance. 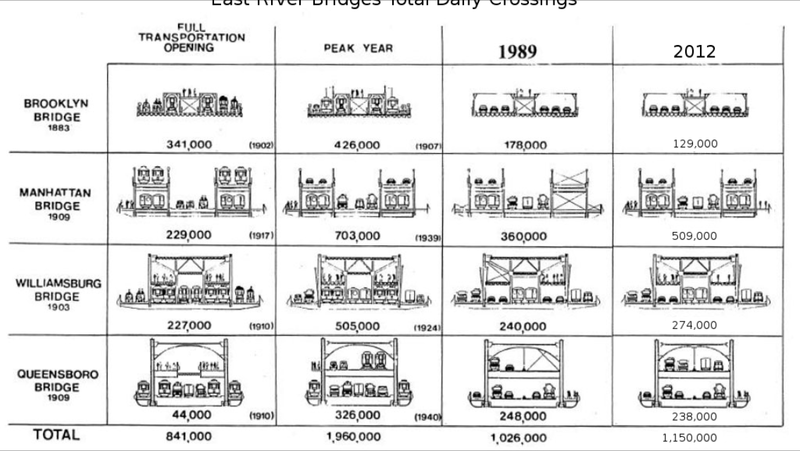 A few factors have reduced the live load capacity from what Roebling built. The removal of the middle trusses, the increased size of the outer trusses and the addition of the overhead stays in the early 1950’s increased the dead load and decreased the live load. This was resulted in doubling the roadway width from 16 to 33 feet. At the same time, the roadway deck was changed to metal/concrete. This replaced the original wooden paving blocks, which frequently caught fire. This also resulted in an increase in dead load and decrease in live load. The Bridge was probably 8 times as strong as it needed, based on what horse drawn vehicles could carry. There were separation limits on the railroad due to the Bridge’s live load. The separation limit was 700 feet for both the el trains and trolleys. Even with the separation limit, the single biggest component for Roebling’s live load calculation were pedestrians. There’s a 5 foot dip in the bridge roadway at the towers. This is due to overloading by trolley cars. The main cable slipped in its saddle. There are a lot of estimates for the peak rate for cyclists. Just about all are based on mathematical models because there are few places that can supply enough cyclists to maintain peak flow. This goes for the paper referenced by NACTO, for its estimate. The best that the Five Boro Bike Tour has been able to achieve on a sustained basis is around 6000/lane-hour. It’s unlikely a 10 foot lane on the Brooklyn Bridge would be able to maintain 6K/hr because of the climb. Bikes approaching stalling speed reduce capacity quite dramatically. Extraordinary efforts by marshals are required to keep the Five Boro Bike Tour moving on both Cats Paw Hill in Central Park and on the Queensboro Bridge. Note this is referenced through NACTO’s website. Note result (2) on page 11 gives the capacity as 2500 per hour-meter. A 10 foot wide lane is 3 meters wide, hence NACTO’s figure of 7500 per hour. Also note the sampling interval discussion on page 11. Rather than counting the number of bikes for 15 minutes, the authors used sampling intervals of 8 to 20 seconds. Their stated reason was the inability to reliably sustain saturated flow for longer periods. The attachment makes no reference to live and dead loads, which are usually measured in lbs per linear foot. It’s irrelevant to the bridge’s weight bearing capacity. Yes, before all the subway tunnels that run through trains between Brooklyn, Manhattan, and the Bronx were built. Referring to the throughput factoid is like referring to how Kings County used to be the most productive agricultural county in the US in a discussion of how New York City can meet its food needs. The Brooklyn Bridge used to have 3 times the throughput before private cars were allowed on 98% of the roadway. If we wish to reduce congestion and improve mobility on the BB;we legitimately need to ask why is 98% of the roadway dedicated to the least efficient mode ? Through put would increase by at least 30%, possibly even 2x.